A campsite in the Midi-Pyrénées? The Yelloh! Village Le Talouch is ideally located in the heart of Gascony, between the Pyrenees and the Mediterranean, very close to both Toulouse and Tarbes. 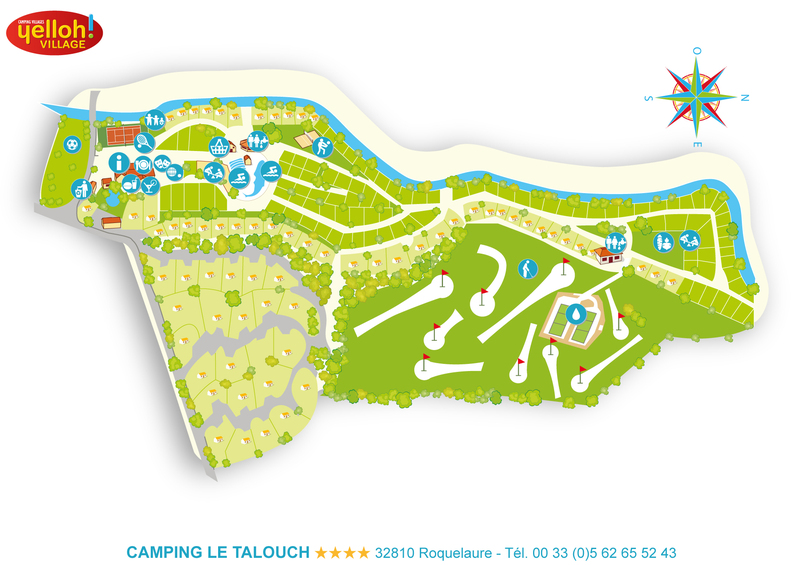 Our Le Talouch campsite is perfect for both sports-focused and relaxing family holidays. Children will be able to enjoy the clubs that are set up especially for them, while parents can set off to explore the region or relax by the swimming pool. We're really looking forward to seeing you at the campsite in the Midi-Pyrénées! Excellent surroundings and the owners were very helpful and welcoming . It was a lovely and friendly campsite. i also liked the activity based approach at the campsite. Close to Roquelaure, an authentic little Gascon village, you'll be staying on the route of St James' Way. In the heart of the countryside, this really is a peaceful little region that hikers will simply love. During your holiday at the camping Le Talouch, you'll be able to navigate the rapids, do some mountain biking and stroll up and down the hillsides of Armagnac without risking getting lost, as at the campsite you can hire a GPS system that you'll find very useful when you're out and about. You should also pay a visit to the towns of Auch, Gimont and Toulouse, the Cité de l'Espace theme park, Toulouse stadium and the Airbus museum, which are all located in the area surrounding the holiday village. For those who enjoy great food on holiday, Gers has some wonderful local specialities, including foie gras, duck breast, Armagnac and fine wine from the local Gascon vineyards, so your taste buds are in for a real treat! Camping in Auch also means discovering and sharing the traditions of south west France, with the local bandas, Gascon bands, the feria del Toro in Vic-Fezensac, traditional festivals, foie gras, duck and plenty more! Take a little time to relax in tune with the countryside during your camping holiday in Auch, in one of France's loveliest regions!